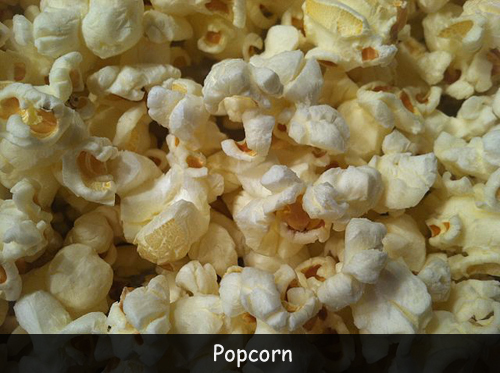 Popcorn is a type of maize that is eaten. It is one of the most favorite snack foods in the United States. It is also the official snack of Illinois. It is a low-calorie snack and contains only 31 calories in one cup. It has more protein than any other cereal grain. It comes in two different shapes that are snowflake and mushroom shape. The snowflake shape is comparatively larger and most commonly served in America to the public. Mushroom shaped are generally used in confections like caramel corn etc. There are six different types of maize that are pod, sweet, dent, flour, flint, and popcorn. The scientific name for popcorn is zea mays everta. Traditionally, Native American used dried herbs and spices to add flavor to popcorns. Water makes a kernel pop. They can pop up to three feet high. Orville Redenbacher is the best-selling popcorn in the world. Native Americans ate popped corn and made beer and soup out of it. The ideal popping temperature for preparing this snack is 400-460° Fahrenheit. A large part of US popcorn is grown in the Midwest specifically in Indiana, Nebraska, Ohio, Illinois, Iowa, Kentucky, and Missouri. Two tablespoons of kernels are enough to make one quart of popped corns. The world’s largest ball of popped corn was created in 2013 at the Indiana State Fair. Popcorn became the first food to be microwaved in 1946. It was done by Percy Spencer, inventor of the microwave. The first ever commercial machine to produced popped corn was invented by Charles Cretors in Chicago.